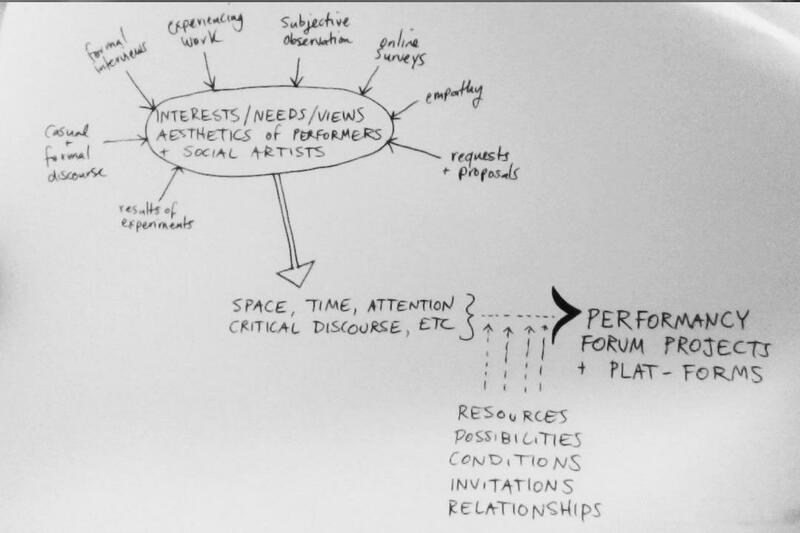 PERFORMANCY FORUM is an ongoing and ever-shifting platform for performance theory as practice and vice versa. Monthly one-night exhibitions are the foundation of PF, usually taking place on second or third Thursdays at PPL Space in Brooklyn, NY. Conceptual cores for each event will be devised around the practices of the involved artists. Participation in organization and structuring of each event over e-mail and in person will be emphasized this season, under the overarching title for Spring 2015, IN FORMATION. To participate, send a proposal for a performance or other performative activity that could be realized on or across these three Thursday evening at PPL Space in conjunction with projects by 3-4 other artists. --A text or video or some kind of “information” about what you are doing. --What form a performance, presentation, or other type of public interface would take (i.e. duration, tech needs, spatial considerations, anything else you anticipate as considerations for organizing). $: PPL Space is the home and studio of PPL the collective and is rented via the day jobs of the residents. PF is currently unfunded but all donations at the door go to the artists. If you absolutely need financial assistance to travel to NYC or for materials, please let us know what you would consider a fair artist fee/budget amount and if no funding is prohibitive for you. We are considering doing a crowdfunding campaign to pay artists this season and welcome community input on this issue! #: Please visit www.performancyforum.com and www.panoplylab.org/pplspace to view past events and see images of the space, see past conceptual cores, etc if you have never experienced any PF events. Floorplan is available on request. *: We welcome any questions you may have as you make up a proposal.